The Roman follis, struck in a bronze and silver composite, is one of the most highly debated coins in the ancient world. The name was derived from the Greek word "φολίς" meaning a thin layer of metal (cf. Latin folium, "leaf") which covers the surface of various objects; this name was given as the coin was originally covered a thin layer of silver. Historians are unsure of the exact date when the name ‘follis’ was attributed to the coin and numismatists are now convinced that the original follis was actually called the 'nummus' when first struck. In later years, during the Byzantine period, the ‘nummi’ were struck in pure bronze becoming an imitation and remastering of the Roman follis. Since this period, many fakes were produced making an authentic follis rather sought after by collectors and historians alike. Recovered from the Bourton-on-the-Water hoard found on 22nd March 1970. The coin, believed to be almost 2000 years old provides an interesting insight into the views of religion at the time of Constantine’s reign. 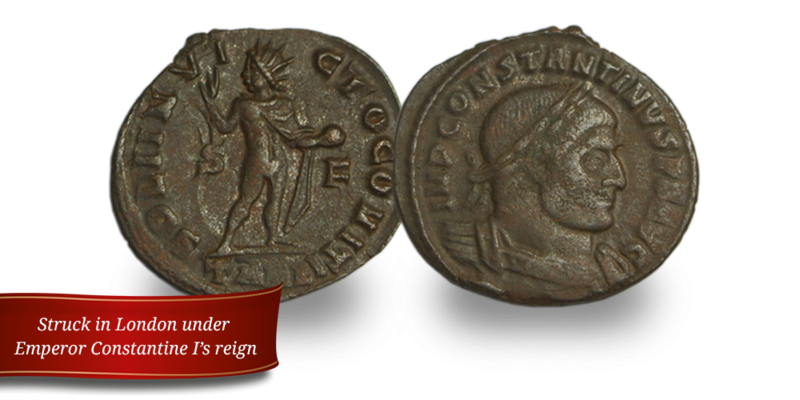 On the obverse of this follis coin is a depiction of Emperor Constantine I, and the reverse portrays an image of Sol, the pagan God of sun. The appearance of both Constantine and Sol on the coin together reflects the changing times, as Christianity was ushered in as the new religion, and paganism became less popular. Within a few decades, paganism would be outlawed by Theodosius. These coins are difficult to source, and so are more valuable and desired. The coins are supplied in a high-quality wood box that houses the coin in a capsule. The wood box is delivered in a black gift box. The coin is also supplied with a small booklet with the stories, high-quality graphics, and a certificate of authenticity to reassure you of the origins of your ancient coin guaranteeing you their provenance for the future. Struck in London around 310 AD under Emperor Constantine I’s reign, this genuine Roman coin is completely unique – due to being hammered by hand, no two coins were the same.